Showering praise on Prime Minister Narendra Modi, US Secretary of State John Kerry on Sunday called for greater Indo-US economic ties and said initiatives like 'Make in India' and 'Sabka Saath, Sabka Vikas' can be turned into a win-win situation for the "planet as a whole". "The moment has never been more right to tap the incredible possibilities between India and the US," he said here at the 7th Vibrant Gujarat Summit, adding that the economic partnership is already getting stronger by the day. Lauding various initiatives announced by Modi, he said, "I was very taken during PM Modi's campaign 'Sabka Saath, Sabka Vikas', participation of all for development of all. That sounds like a pretty good slogan for all of us to adopt, and if we adopt it we can get the job done." "We will turn Modi's 'Make in India' initiative a win-win opportunity for the planet as a whole," he said. Annual trade between goods and services between US and India has grown nearly five-fold since 2000. Bilateral FDI now stands at nearly USD 30 billion, he said. "...I want to ensure that our economic relationship grows stronger in every respect. We share PM Modi's goal of increasing our countries annual trade five-fold in years ahead and we want to expand our commercial ties ...we can take this relationship to the new heights that we envision," he said. India and the US have a common responsibility, together with other country partners, to prove that democracies can deliver for their citizens, he said. 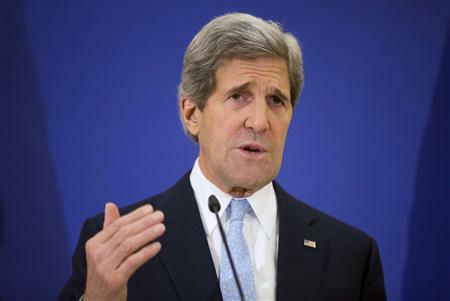 Flagging concerns over climate change, Kerry said it was affecting crop production, economy and raising cost of doing business. "...believe me if it continues down the current trend line we will see climate refugees, fighting each other for water and seeking food and new opportunities," he said. Stressing sustained energy policy to fight climate change, he said India government has now committed to greatly expanding wind resources, make agricultural systems more resilient and increase its national solar mission five-fold. "Together we can create an environment where all companies play a leading role in bringing cutting edge technology, equipment and capital know-how not just to India, but countless countries that need this growth and development," he said. Talking about changing political and economic situation in India, Kerry referred to Modi's journey "from a young man who sold tea right by the rail road here in Gujarat to the PM's residence on the Race course Road". "...we join with you celebrating extraordinary new chapter of India that is being written today," he said.